Finding the job of your dreams can be elusive for many people. How do I start my job search? How do I get to actually speak face-to-face with someone who has the authority to hire me? How can I separate myself form the other candidates? 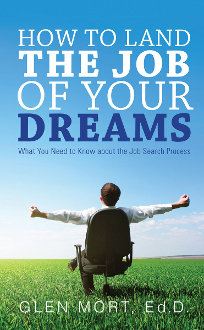 All these and many more questions are answered by Dr. Glen R. Mort as he reveals the secrets of a successful job search and how you can actually find the job of your dreams. Dr. Mort shares his twenty-five years’ experience as a human resources and educational professional and provides the reader with simple yet effective techniques that guide the reader to achieve the end result of that landing perfect job. His decades of experience have led to this compilation of the best ways to successfully get the job of your dreams. These simple, easy-to-follow steps will put anyone from the entry-level customer service representative to executive level professionals on course to achieve any career goals set.